The biggest thing after music lessons here at Shine is colouring! Our younger students (but sometimes the odd older student or teacher) create wonderful artworks that nicely decorate the walls of Shine Music here. We have a variety from the humble colouring stencils to grand original masterpieces. 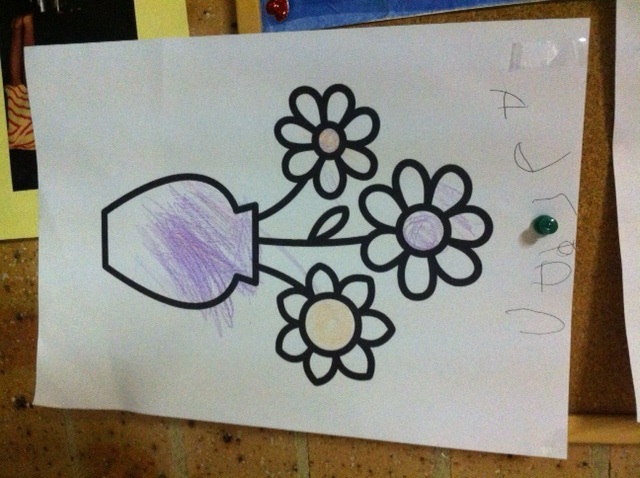 Today’s masterpiece of the day (well I only had the option of choosing out of one) belongs to Adrian’s flowers in a vase. Simple, yet to the point. Artist Adrian has stated he will return next week with a Ben 10 masterpiece. I am eagerly looking forward to it!